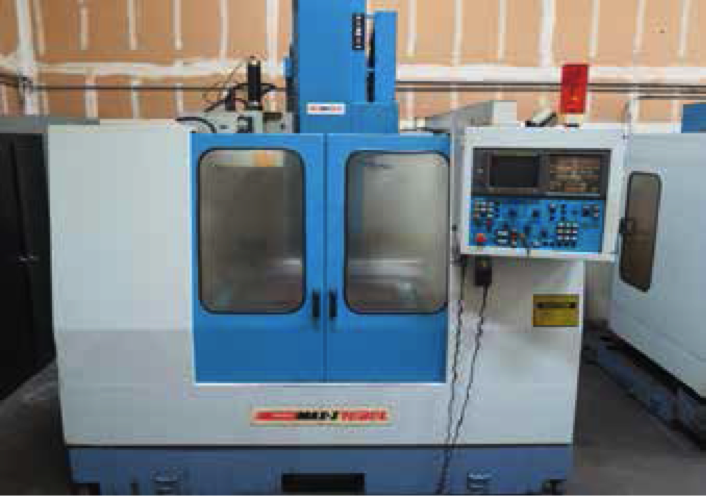 1995 Supermax MAX-3 REBEL CNC Vertical Machining Center s/n 607355 w/ Fanuc Series 0-M Controls, 16-Station ATC, BR-40 Taper Spindle, Hand Wheel, 15 ¾” x 37 ¼” Table, Coolant. 1995 Supermax MAX-1 REBEL CNC Vertical Machining Center s/n 510241 w/ Fanuc Series 0-M Controls, 16-Station ATC, BT-40 Taper Spindle, Hand Wheel, 16 ½” x 33” Table, Coolant. Matsuura “Mini-Master” MC-500V CNC Vertical Machining Center s/n 7912853 w/ Matsuura Yasnac System 5 Controls, 16-Station ATC, BT-35 Taper Spindle, 12 ½” x 36” Table, Coolant. Cadillac mdl. 1422 14” x 22” Geared Head Gap Bed Lathe s/n 059045 w/ 83-1800 RPM, Inch Threading, Tailstock, Steady Rest, Trava-Dial, 5C Collet Closer, 8” 3-Jaw Chuck, Coolant. Lagun / KBC FTV-1 Vertical Mill s/n SE-5538 w/ Newall Sapphire DRO, 3Hp Motor, 70-4200 Dial Change RPM, Chrome Ways, Power Feed, 9” x 42” Table. Supermax Vertical Mill s/n 85-1214755 w/ Mitutoyo Linear Scale Counter DRO, 2Hp Motor, 60-4200 Dial Change RPM, Chrome Ways, Power Feed, 9” x 49” Table. Falcon Chevalier FSG-618M 6” x 18” Surface Grinder s/n A3866056 w/ 6” x 18” Magnetic Chuck, Coolant. K.O. Lee BA900X Tool and Cutter Grinder s/n 9597-866 w/ Compound Grinding Head, 5 ¼” x 27” Table. Victor DCM-5TS 20” Vertical Band Saw s/n LV50629 w/ Blade Welder, 20” x 24” Table, Fence System. Carolina mdl. HV20 7” Horizontal Band Saw s/n HV20-5757 w/ Manual Clamping, Conveyor, Coolant. Dake mdl. 25H 25Ton Hydraulic H-Frame Press s/n 177103. Rutland Pedestal Carbide Tool Grinder. Delta mdl. 17-900 12-Speed Pedestal Drill Press s/n R9404. Alltrade Table Model Drill Press. Abrasive Finishing “Super Quiet Burr Bench” Media Tumbler. 10Hp Horizontal Air Compressor w/ 80 Gallon Tank. Prentiss 6” Pedestal Mounted Bench Vise. (6) Kurt 6” Angle-Lock Vises. Insert Milling, Turning and Boring Tooling. KDK Tool Post and Tool Holders. (72) 5C Collets w/ Rack. (25) R8 Collets and Tooling. 5C Spin Fixtures, Collet Closer and Collet Block Set. (6) Huot Drill, Tap and Endmill Cabinets. Carbide and HS Endmills, Drills, Reamers, Taps, Radius and Keyway Cutters. Brown &amp; Sharpe Bore Mic Set 2.0”-2.4”, 1.6”-2.0”, 1.2”-1.6”. Brown &amp; Sharpe 0-6” OD Mic Set. (2) Starrett 6”-9” OD Mics. Brown &amp; Sharpe 9”-10” OD Mic. Starrett 7”-8”, 8”-9” OD Mics. Mitutoyo 6” and 12” Digital Calipers. Mitutoyo and Import 6” Dial Calipers. Granite Indicator Base w/ Dial Drop Indicator. Aluminum and Steel Raw Stock w/ Racks. 36” x 72” Steel Work Bench w/ Bench Vise. Storage Cabinets, Shop Carts and Shelving.